The Fordham Urban Law Center is pleased to announce a call for participation for its annual conference, “Sharing Economy, Sharing City: Urban Law and the New Economy,” which is being held on April 24, 2015. Abstracts are due by February 6, 2015. The full call is listed below. Trends in the sharing economy have spurred complex legal and regulatory issues that have moved to the center of urban policy debates, from Berlin to Seoul to New York City. As web-based, peer-to-peer companies challenge traditional regulatory paradigms, state and local governments are trying to respond creatively to rapidly changing digital and economic landscapes. This interdisciplinary conference will explore the relationship between the sharing (or “peer-to-peer”) economy and economic and community development, consumption, ownership, mobility, and a shifting urban workforce. It will investigate diverse approaches to legal and regulatory issues facing city governments, entrepreneurs, workers, consumers, and residents in today’s dynamic technological and built environments. The goal of the event, and anticipated edited volume following the conference, is to advance new possibilities for problem solving in this transforming area of urban law, technology and entrepreneurship. PROPOSAL CRITERIA AND SUBMISSION PROCEDURE: Prospective participants should submit a topic proposal (maximum length: 350 words) to FordhamUrbanLaw@gmail.com (Subject: Conference Abstract/Paper Submission from [NAME]). The deadline for proposals isFriday, February 6, 2015. Selected participants will be notified of final decisions in early March. HOW TO REGISTER: Please visit http://law.fordham.edu/urbanlawcenter.htm or email FordhamUrbanLaw@gmail.com for registration details. Space is limited. The final conference agenda is forthcoming and will be available on the Urban Law Center website and conference webpage. The Center can assist panel participants with travel costs; the extent of support will depend on a participant’s anticipated needs. 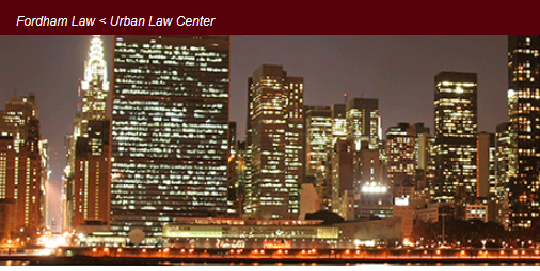 ABOUT THE URBAN LAW CENTER: The Urban Law Center at Fordham Law School in New York City is committed to understanding and affecting the role of law and legal systems in contemporary urbanism. The Center is a partner of the Fordham Urban Law Journal, Fordham Law School’s second-oldest publication, and co-sponsors the State & Local Government eJournal on SSRN’s Legal Scholarship Network.